After leaving Corowa and heading west, we hit the Hume Highway and turned left to head north. Fortunately we weren’t on the main road for TOO long, before we turned right and headed for the hills. 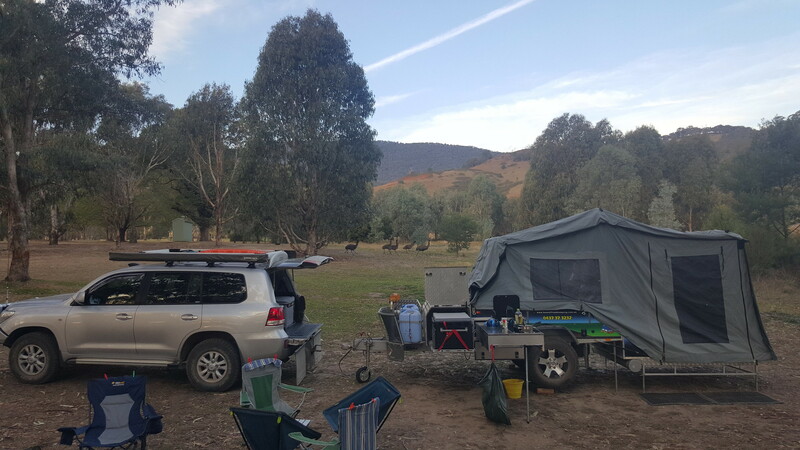 A quick stop in the beautiful little town of Adelong for a pit stop, before continuing on to Tumut and then to begin the hunt for a camp site. We looked at a number of different options before settling on a spot at Yachting Point. As usual, we scratched around for a while before settling on a suitable site and location, but we finally got ourselves together and found a good spot. There was quite a bit of wildlife around at this spot which all the kids enjoyed. We saw a family of emus and another of kangaroos before dinner to complete the coat of arms sighting. I woke up in the middle of the night, hearing footsteps around the campsite. I opened the window to check it out and the family of emus were back, wandering through, checking everything out. They must have been working shifts with the wombats, as they came through later in the evening. Bacon, and plenty of it, was on the menu for breakfast the next morning before we head into Tumut to have a look around town. As per usual, we ended up at a bakery for lunch before taking the kids to a park. Whilst at the park we had THAT conversation. The conversation that we seem to have with Trent and Leanne when getting towards the end of a trip. The rain looks like it is coming, when do we want to pack up and go home? Long story short, the answer came back… NOW! Pile the kids into the car, back to the camp site, and then pack up everything as quickly as we could (as the rain really was coming!). Thirty one minutes later we had packed up and were ready to roll. Given that this was a full campsite pack away, with nothing prepared, we were pretty happy with that! Six hours later we were home again. Thanks to Trent and Leanne and the kids for another great trip – looking forward to the next one!